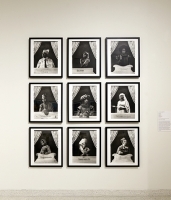 In this project the Caste portraits are revisited to speculate on parallel histories linking Northern England and Haiti. The portraits are exhibited alongside a film of a river journey from Manchester, along the Manchester Ship Canal, past Ellesmere Port and finishing in Liverpool. Ellesmere Port, the town where Leah Gordon was born, is equidistant between Liverpool, a city built upon the slave trade and Manchester, built upon the industrial revolution. Quotes from historians and scholars appear on screen, which highlight shared economic and political histories. Two short 16mm films, one of machinery fabricated near Liverpool and now lying ruined and overgrown sinking into the earth in Haiti and one of the storage rooms in the National archives where the only known printed copy of Haiti's Declaration of Independence dated January 1st 1804, was discovered, show Haiti’s history hidden and embedded in Britain’s colonial archives whilst Britain’s industrial past lies rusting and overgrown in Haiti’s tropical landscape. These historical reflections sit alongside a prophetic photographic reconstruction of William Blake’s illustration of ‘Europe Supported by Africa and the Americas’ used by the British abolitionists. The reconstruction functions as a stark look at a future where the old economic power balances are shifting and changing.